Ryan takes a culinary tour of New York City on the 7 subway train. He stops at some unique restaurants where he gets to sample and cook authentic international cuisine. As the train zips through various neighborhoods throughout the borough of Queens, Ryan makes several stops along the route to try some of the city's eclectic cuisine. In the Woodside neighborhood in Queens, Ryan visits a family-run Italian bakery. V & V Bakery shows him how to make their delicious Italian Spritz Butter Cookies. Then, Ryan heads to Little India in the Jackson Heights neighborhood of Queens. He stops by Rajbhog Gourmet Indian Food & Sweets where owner, Nirav Shah, serves vegan and vegetarian meals. Ryan samples a few delicious dishes and tries to guess the ingredients. Nirav makes Ryan a traditional Indian snack -- Onion and Spinach Pakoras. 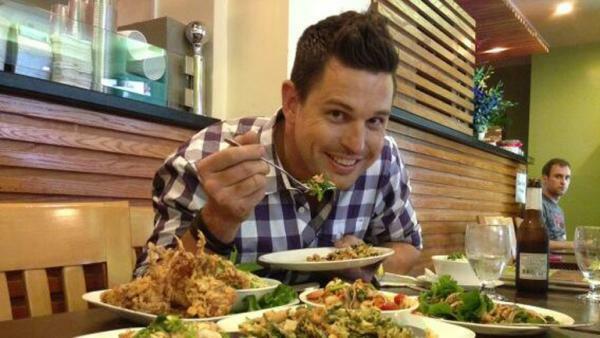 Ryan's next stop in New York City is for some Thai food. He meets up with Larry Tipmanee, owner of SriPraPhai Thai Restaurant. Larry shows Ryan how to make one of their signature dishes -- Crispy Watercress Salad, which is served with chicken, shrimp and calamari. As Ryan wraps up his culinary adventure on New York City's 7 Train, he heads to Tortilleria Nixtamal where owner Shauna Page makes tortillas just like the Aztecs did. Ryan gets into the kitchen with Chef Santiago Mendez who teaches him how to make one of their most popular dishes -- Chicken Tinga Quesadillas. These cookies are rich and buttery. They will be a hit with any crowd. Try this traditional, vegetarian Indian snack. Lots of ingredients come together to make this flavorful salad! The smoky chicken gives a twist to the traditional quesadilla! Go behind the scenes as Chef Ryan Scott gets a taste of New York City's international cuisine.